This year, I spent only one day at the NAMM Show ’19 (Anaheim Convention Center) and even one day will give you enough momentum in your music career to last all year. The NAMM Show is a must-attend event for anybody whose career centers around music—whether you are a music creator, performer, educator, or music industry professional—dealer, manager, attorney, curator—music business comes together here. It is a unique opportunity to see and try out the latest instruments and technology, gain insight and industry knowledge from various panels and speakers, experience live performances, and build important career-sustaining relationships. I’ve curated a list of my takeaways and tips on how you can prepare for your next NAMM Show. Be able to sum up what you do in one sentence, and DO practice saying it a few times. If you are a performing musician, be able to nail down your style along with “I sound like X.” If you are a music creator be specific about your genre, i.e., production music, scoring films, recording artist. You don’t have to explain that you are “aspiring” and that your music career is a side hustle. Own your title and share your accomplishments if the conversation leads you in that direction. If you sell a product, explain what it is with enthusiasm, but don’t become “salesy” unless you are actually in your booth demo-ing to potential buyers. When networking and socializing, align yourself and your product with how you and your product serve the music community. You will be remembered much more by emphasizing service—‘how I can help YOU?’, rather than sales pitch—‘please buy my product!’ Be mindful of the difference between a booth demo and having a conversation with somebody you just met. 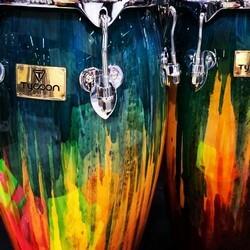 Gorgeous colors on bongos by Tycoon Percussion. Don’t be afraid to reach out to music industry professionals whose content you consume regularly such as podcasts, YouTube, Soundcloud, or social media. One of the highlights for me was to chat with DIY Musician podcaster and VP of Marketing for CD Baby, Kevin Breuner (Small Town Poets), about his college musical experience at Belmont University in Nashville, TN. I’m always interested to hear about a successful musician’s musical training since I teach college music theory, and Kevin generously reflected about his courses in theory, musicianship, jazz, and commercial music. Interestingly (and extraordinarily!) Kevin’s band was signed to a label while. in. college. (FYI, this is not the norm!) I’m a huge fan of the DIY Musician podcast for its authentic, practical information and advice. I had heard Kevin speak last year at NAMM ’18 on a panel called “Trends in Distribution” which was one of the best panels I had ever heard on how to get paid in music and inspired my article HERE. You can also read another article on the best podcasts for musicians with includes DIY Musician HERE). Wear good walking shoes as you will be walking for about 8 hours straight each day. Backpacks, cross body, fanny packs, anything that keeps you hands-free, are best. Bring snacks and food if you can. I brought an energy smoothie that I had made and frozen the night before. It had completely thawed by the time I was ready to consume it, saving me money and keeping me energized for another few hours. There are a lot of food choices at NAMM, but if you are trying to make clean, healthy food choices, it is not cheap. If you are staying at a hotel, one trip to the grocery store the night before to buy nutritious snacks can really help you get through the day without crashing. Parking was not horrible because I arrived early in the morning. Plan to pay around $14-$20 for parking each day if you are driving and go as early as possible. At the Anaheim Convention Center, NAMM designates several parking garages that are all within a 10 minute walking distance. Be prepared to walk a lot. 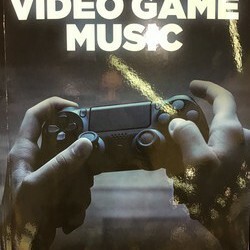 Gaming Music is legit as solo instrumental music as seen in the Hal Leonard booth. Be ready to go with business cards, but if you forget—don’t worry—social media is becoming the new business card. Many people are exchanging social media handles right on the spot. Instead of requesting a card, many people are asking, “Where can I find you?” Make sure you are active on at least one of the following social media platforms: Instagram (most popular), Facebook, Soundcloud, Twitter, or Snapchat. This seems to be the case mostly for musicians and music creators. Music industry professionals and businesses traditionally have cards ready to trade. Have plenty of memory ready to go on your phone and post often on your platforms throughout the event. Use appropriate hashtags for extra exposure for yourself, and to promote others. 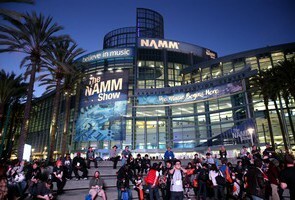 NAMM is active on all platforms and will often engage with your content, so be sure to tag them. They may even share your posts! Use best practices on social—promoting and helping others will always come back to you in a positive form. With the most energy! 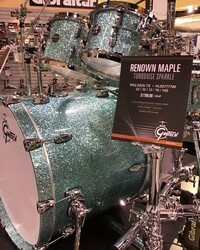 Gretsch Booth displaying their “Turquoise Sparkle” kit. NAMM has its very own app that functions best as a scheduling tool. The NAMM app kept track of all of my “favorite” events so I was able to quickly build and access my schedule. I found the map on the app very difficult to navigate but despite the enormity of the venue, you quickly get oriented to the locations of the main floors. All booths are numbered so once the app tells you the number, it’s not difficult to make your way to that location. Wear your own merch and bring samples of your products, if possible. I had several people come up to me and ask about my “Musician” tote bag that I had designed and were interested in collaborating with me. I was also able to show a prototype of my recent publication with Hal Leonard, “Music Theory Staff Paper,” to various folks I met. If you have a physical product that is wearable or portable, this is the place to show it! I love that musicians are generally great at wearing fashion that reflects themselves. You cannot find a better place to people-watch! Find your balance between being comfortable and expressing yourself as an artist or music industry professional. I won’t lie, there is a lot of BLACK DENIM. You do you. I played a lot of pianos, including, the Sauter, Bluthner, Bechstein, and Mason and Hamlin. 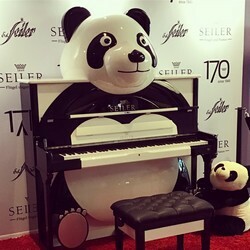 The panda piano by Seiler was the most eye-catching for obvious reasons! As a music educator, the program that impressed me the most was My Music Staff—and I started using it right after NAMM. As I walked around the convention, I came across the My Music Staff booth and thinking it was another music notation program, was pleasantly surprised to learn that “Staff” was a play on words—it is a scheduling and billing program for music studios and schools. This program allows a single music instructor or a school managing multiple teachers, an easy platform to schedule, communicate, and bill their students. As a university lecturer and piano instructor, I implemented My Music Staff as a communication tool and have seen a significant increase in attendance and performance in my classes. I was strongly drawn to My Music Staff’s texting feature because communicating with my students by text has by far been the most effective. I had tried Slack but I didn’t like the interface, and other communication/texting tools were too expensive. My Music Staff has a free 30-day trial and then the membership is $12.95/month. I have scheduled everything from lectures, individual lessons, special events, and office hours on this platform and can choose how and when students are notified with reminders (I choose email and text). I am basically running my classes like a professional business. You know the texts you get from your dentist or doctor? I always appreciate those and now send them to my own “clients!” This automated tool ensures that I reach all students and I’m even able to include a short description of the topic for that meeting. It has helped my students stay in communication with me and they are better prepared for lecture because they are constantly reminded what is coming up. This program has proven to be directly related to my students’ success. With tens of thousands of people attending, the experience is exhausting (especially for introverts like me!). Push yourself to see as much as you can but don’t feel bad for not connecting with everybody or attending every event on your schedule. Make time to reflect, take notes, journal, and breathe. Absorb and learn as much as you can. Some of the presentation panels are enlightening and some are more of an overview for a general audience. All panels have a Q & A opportunity so take advantage of that opportunity to get your specific questions answered. Don’t worry about trying to ask a general question that the whole audience can relate to. The audience will still gain insight from your personal issue. The energy at NAMM can be summed up in one word—inspirational. No matter what you do in music, you will be inspired to strategize and take action in your music career.